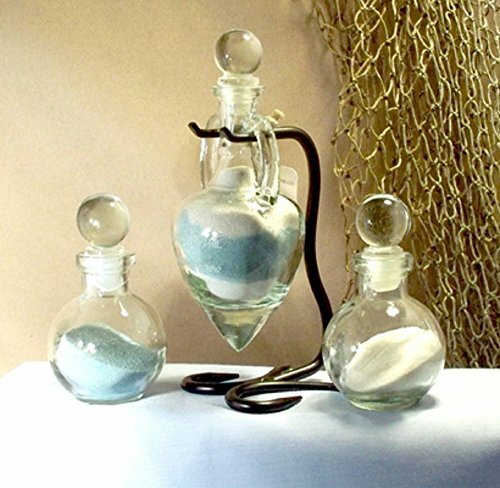 Personalized Unity Sand Ceremony Set - "Amphora" style includes (1) 8" Tall / 6.1 oz. Center Amphora Vase with a glass stopper suspended on a black metal stand plus (2) 5.25" Tall / 3.4 oz. side pouring jugs with glass stoppers plus (1) plastic funnel for easy pouring of the sand. Free Etching includes First Names and the Date of the event on the center amphora vase. Etching style is our very own Freehand Calligraphy Script created by our talented Calligraphy Artists and sandblasted into the glass for a permanent finish. No other font is available for this set.